Now that Student Information is complete, now is the time to focus on the various types of programs that the students participate in. This is incredibly important as they tell us which students qualify the school for certain types of funding based on certain needs. * 504 Accommodation Plan is not reported for Fall 1, but is required for Smarter Balanced Reporting which happens in the Spring and should be updated earlier for students to receive testing modifications as needed/required. 504 Accommodation Plan although 504 can also be reported as Eligible. Other Attributes specific to the program. These attributes will be covered in the section below. Step 2: Current Programs will be listed at the top of the page under Current Instructional Programs. Modifications may be made to programs as needed. Please remember that very few programs are continual programs (ex. 504s, IEPs/SpED programs), most programs are annual and require start/end dates. Step 4: Enter Site, Start Date, and Eligibility Code (Eligible vs Participating) depending upon the needs of the program type. Additional, program-specific information follows the screenshot. Step 5: Select Add to create the new program. This program is usually managed by a Special Education Coordinator on site who is responsible for the designation of the special education students. Start Date = First day of IEP (Original IEP date). End Date = Leave blank unless the student no longer receives services. 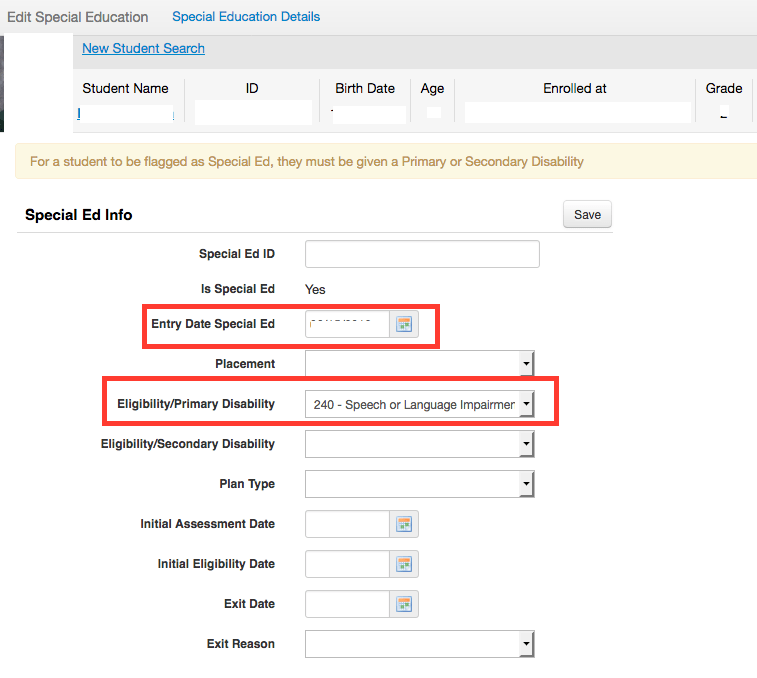 Much of the rest of the information may be housed in Illuminate, but is not vital for the SPRG to populate the critical fields for the Special Education record. LEAs should submit student eligibility for Special Education. Generally, the start date for eligibility is the start date of a given student’s Individualized Education Program (IEP). Other Attribute: Migrant Student ID must be 11 digits and start with 06. This is not the same as the identifier used in the COE Star System, which is alphanumeric (may include both letters and numbers), and is generally delineated with 7 characters followed by a hyphen, and then a number representing the number of siblings. LEAs will not need this number, and instead will need the MSD number. Contact information for migrant education regional offices can be found on the Migrant Education Regional Offices Web page at http://www.cde.ca.gov/sp/me/mt/regions.asp. Students do not need to be participating in a GATE program. Participation in this program should be verified on an annual basis and should be updated throughout the year. This is important because these data are needed to appropriately register students for the California Assessment of Student Performance and Progress (CAASPP). Start Date = The date the student was identified as having a 504 Accommodation Plan. End Date = Leave blank unless there is a change to the program. Best practice says to leave this date open unless a student is determined to no longer require a 504 Plan. Start Date = Date the student was identified as homeless. End Date = Leave blank unless there is an end to the homeless status or the student leaves the school. From the CALPADS Data Guide published 8/09/2016 v8.1. Hotels/Motels = Living in a hotel or motel due to not having a fixed, permanent residence. Temporary Shelters = Awaiting foster care placement or living in transitional housing. Yes = not in the care of their parent or guardian. Yes = a homeless student who is less than 18 years of age who has left home without parental/caregiver permission and stays away for one or more nights. If this is selected, Unaccompanied Youth must also be selected. Start Date = The first day of school. NSLP eligibility includes eligibility for both the Free Meal Program as well as the Reduced-Price Meal Program. NSLP eligibility is used in combination with Parent Education level to determine whether a given student is socio-economically disadvantaged accountability subgroup. NSLP is a one-year designation. NSLP eligibility must be submitted annually. Students attending schools with a National School Lunch Program (NSLP) provision 2 or 3 status or participating in a Community Eligibility Provision may submit FRPM records for students found to meet the federal income requirements for FRPM based on an alternative household income form. LEAs may submit FRPM records for students found to be eligible for free meals based on a local direct certification process. LEAs do not need to submit FRPM records for students found to be eligible for free meals based on the state direct certification process conducted by CALPADS. NOTE: Specific local user access must be granted to LEA staff to view these data. As of 2014, Foster Youth Programs are no longer reported through the SPRG CALPADS file. Foster Youth numbers are determined based upon weekly data matches within the Child Welfare System/Case Management System (CWS/CMS) with CALPADS enrollment data. Therefore, the number of foster youth identified on the LCFF Funding Unduplicated Counts comes from this state or local matching system. According to CALPADS Data Guide 8.1, August 9, 2016, 90% of the foster youth are identified through statewide matching systems, and over time 100% will be identified since the local systems pull from the same source.